Three great buss compressor emulations with some welcome enhancements and a staggeringly convincing 'analogue' sound. Excellent analogue sound. Full circuits are modeled. Three distinctive processors. Rack or individual plugins. Precise incremental knobs. No mono versions. Sidechain high-pass needs wider range. Slate Digital has built an enviable reputation for emulating analogue staples in various categories, so its latest venture - Virtual Buss Compressors - is certainly a logical next step. Much like its Virtual Console Collection and Virtual Tape Machines, VBC (VST/AU/RTAS/AAX, iLok 2 required and included) isn't endorsed by any particular manufacturer, giving it the freedom to enhance the originals. Nevertheless, the three plugins that comprise the collection - FG-Grey, FG-Red and FG-Mu - are clearly sourced from three classic designs: the SSL 4000 Console Compressor, Focusrite's original Red 3 Stereo Compressor/Limiter, and the valve-based variable mu (a valve topology acting to vary the compression ratio depending on the input signal level) of the Fairchild 670 and Manley 'Vari-Mu' units. Both the Fairchild and Manley models have been modelled in the creation of FG-Mu. During development, Slate made a conscious decision to focus on non-linearities like harmonic distortion, phase distortion, frequency alteration and noise, as well as the underlying compression characteristics - so in theory, we really are talking 'warts and all'. "A rack plugin is also included that enables you to chain the three units with drag and drop re-ordering and A/B snapshots"
All three VBC plugins feature A/B snapshots, their own preset banks, a high-pass sidechain filter and output Mix control. However, a rack plugin is also included that enables you to chain the three units with drag and drop re-ordering and A/B snapshots. Handy. The compressors themselves are all pretty straightforward, and if you've used the hardware equivalents (or any good software emulations), the control sets will hold no surprises - although they do take advantage of more accurate incremental parameter changes, of course. For FG-Grey, this means adjustable Attack, Release (with Auto option), Threshold, Ratio, and Gain make up with switchable metering (In, Out and Gain Reduction). FG-Red's famed transformer circuit includes adjustable drive level. Aside from that, the Red boasts a very similar set of controls to the FG-Grey: Attack, Release (with Auto setting), Threshold and Ratio, along with switchable metering (In, Out and Gain Reduction). Of note, however, is that the limiter circuit from the actual Red 3 isn't included. Fairchild's valve-based 670 operates in both Mid/Side and stereo modes, and both are included on the FG-Mu. Slate have also stuck with the independent input level and threshold controls. However, Attack and Release are handled by individual controls rather than the six time-constant options of the 670. You also get independent Gain make up (again, not a feature of the 670). Finally, FG-Mu can also switch between linked stereo and dual mono modes, the latter featuring separate controls (including a high-pass filter) for each channel. "FG-Mu imparts an enhancer-like high-frequency sheen"
All three VBC plugins have an audible effect on the input signal even when they appear to be delivering zero gain reduction. This is most obvious with FG-Mu, which imparts an enhancer-like high-frequency sheen, and FG-Grey, where the mids feel slightly scooped. FG-Red is the most neutral, but even that one still pushes a slight upper-mid enhancement. It's when you start compressing, though, that the personality of each compressor really comes through. FG-Mu has the most character and is just beautiful across drum overheads, drum sub mixes and overall mixes. The high- frequency sheen is accompanied by a low frequency "glue", and although you can drive the compression hard if you want to, there's plenty of flavour even at gentle settings. FG-Grey is also pretty coloured, which isn't something we would associate with the SSL Buss Compressor on which it's based, and there might be a good reason for that: Slate has bolted a model of a Neve input transformer onto its recreation. This modded design works well under medium-to-heavy compression to retain more punch on loops, drum sub mixes and overall mixes. We'd like the option to be able to disengage the transformer circuit, though, which would presumably give a cleaner sound, possibly more like a typical SSL. Like we said, FG-Red is the most neutral processor at zero-to-low compression settings. But like the original hardware, this is where it works best, adding subtle mix glue. The real clincher here, though, is the adjustable output transformer. This acts rather like a subtle distortion control, and is great for adding bite to the mid-range, whether that's electric guitars, keys or even vocal sub mixes. Slate tell us its planning to add mono-only instances in a future update, and we'd also welcome a broader range for the sidechain filters (FG-Mu's upper limit is 200Hz, while the other two only reach 150Hz). "When compared to other market-leading plugins of a similar bent, Slate's diligent approach has clearly paid off"
Other than that, however, VBC is clearly one of the best software emulations of analogue gear that we've encountered to date. When compared to other market-leading plugins of a similar bent, Slate's diligent approach has clearly paid off, particularly in the excellent non-linear characteristics. This attention to detail, amongst other things, has resulted in VBC taking rather longer to make it to market than anticipated, but now that it's here, we can emphatically say that this is a great package, presenting everything you need to compress your master buss, sub mixes and plenty more besides with real character and analogue authenticity. 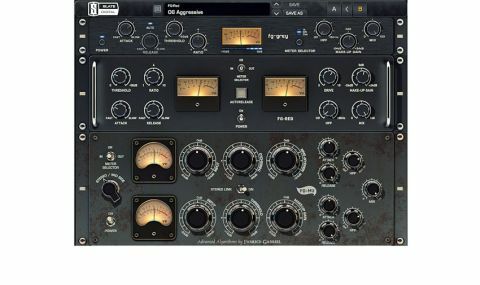 Like Trigger, VCC and VTM before it, Slate Digital's Virtual Buss Compressors is an absolutely outstanding effort that sets new standards.